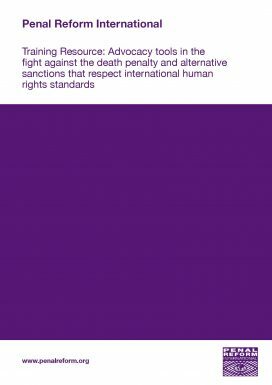 This resource is for NGOs, human rights activists and civil society organisations working on the abolition of the death penalty and on promoting alternative sanctions that respect international human rights standards. It aims to build and strengthen civil society organisations’ knowledge and awareness of advocacy and what advocacy methods are available. It covers issues such as using the media to influence, and how to build coalitions to strengthen your advocacy work. This resource is part of a series of three training resources produced as part of PRI’s programme of work seeking to achieve the progressive abolition of the death penalty and implementation of alternative sanctions that respect international human rights.